The Naniwa Combination whetstone knife sharpener pitches itself as an ideal beginner’s waterstone. There is good reason for this claim. With the combination stone utilizing both 1000 grit for steady sharpening and a 3000 side for the removal of burr, this is the sort of versatility a beginner needs when using an all in one tool. The sharpener is also holsted in a plastic stone holder for minimum slippage and has an affordable price point . 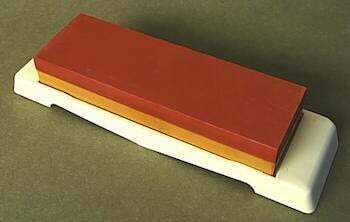 Meaning if this is your first foray into whetstone sharpening and you do not take to it – you haven’t broken the bank having a go. The Naniwa brand is a relatively small Japanese waterstone maker, based in Osaka. With just 45 employees working out of one location, they source local Japanese stone for the job, and have been doing so for over 60 years. (The company also covers industrial sharpening, sandstone engraving etc for clients based in Japan). In short the company has a fine pedigree in the manufacturer of stone sharpeners, while still being small enough to ensure real quality control over their output. Naniwa sharpening and honing stones, in terms of their hardness, are said to sit between the Cerax and Chosera stones (more closer to the Cerax), and in use each stone has a consistent coarseness that makes them very nice to use. While this particular combination stone adheres to the Nawina Japanese stone quality, there are some disadvantages to using a combination whetstone per se. Furthermore, a stone that has just one grit can be flipped to the fresh side if you notice that one side has become too hollowed out for effective sharpening. On a combination grit stone sharpener you need to stop and flatten out the hollowed side in order to continue. A user experiencing some problems with the Naniwa combination stone 1000 / 3000 grit. There is also the issue of combination stones becoming unglued. These stones travel come straight from Japan, in rare instances the transit and/or further wear and tear can lead to the individual stones coming apart. The manufacturer goes as far as warning against this. Japanese stones are highly effective sharpeners due to the fact the grit is only loosely bound together. However, the trade off is that the glue holding the stones together is susceptible to fail. Naniwa state that this is not a ground for complaint or return, and advise that users can take a water-resistant household glue, and rejoin the two halves, or just leave them separate, and use them as regular, single-grit stones. Whether this issue is enough to put you off purchasing a combination stone sharpener is entirely up to personal preference. For some, it is enough for them to look into purchasing single grit whetstones. For their part, Naniwa have a wide range available. This is a good quality combination whetstone from a company that knows what it is doing. High performing stones of versatile grit, this is ideal for any beginner whestoner. More experienced stone sharpener users might want to look elsewhere however.